With their heads soaring 60 feet above the ground, Sauropods were gigantic animals, about the same height and length of The White House. Imagine the tremendous bone strength and muscle force required to support their 65 ton mass, equivalent to the crushing weight of a stack of 30-40 automobiles. The necks of long-necked Sauropods were 30 to 40 feet long (10-12 m), the length of the extended arm of the Statue of Liberty bearing the torch (42 feet). A massive heart would have been required to produce the 700 mm Hg pressure needed to pump blood to the Sauropod's head; the same pressure that is exerted on your body by diving in the ocean to a depth of 30 feet (10 m). It has been calculated that the left ventricle of the dinosaur's heart would have to weigh 2 metric tons to pump blood that high. That is 15 times heaver than the left ventricle of whales. Such an enormous heart muscle would have consumed 64% of the dinosaur's energy (basal metabolism), leaving the creature little energy for everything else. To overcome the problem of pumping blood to their brain, Sauropods may have been aquatic, but this outdated view is no longer accepted. Alternatively, Sauropods may have slinked around on land with their heads held low, grazing on grass with their noses in the turf, but if they raised their heads at the sound of an approaching Allosaurus (a forerunner of T. rex), or to nibble high in the trees, they would have fainted. A 65 ton dinosaur going belly up and crashing to the ground every time it stretched its neck up would fit its name, "thunder lizard" (Brontosaurus), but it is hard to believe that such a design flaw would have survived natural selection (or intelligent design). Another possibility has been suggested that Sauropod dinosaurs may have had a series of hearts along their neck, to bucket brigade blood to their brain, but there are no other vertebrates with a series of pumping stations running up their necks. A recent paper in the Journal of Experimental Biology explores a different possibility for how blood could have been pumped six stories high into Brontosaurs' brain--a siphon. As everyone knows, a siphon can make fluid flow magically uphill and back down again with no force other than that necessary to overcome the friction of the fluid flowing in the tube. Did Sauropods siphon? To test their theory, an Australian team of biomedical engineers and neuroscientists including, Stephen Hughes, John Barry, Jeremy Russell, Robert Bell and Som Gurang, left the lab and ventured onto the theater stage. A theater is the perfect place to perform the experiment, because the stage ceiling is 15m high and equipped with ropes, catwalks, and pulleys to raise and lower curtains and props--all the apparatus one needs to elevate a model Sauropod jugular vein and carotid artery to any desired elevation. The researchers made a vat of artificial dinosaur blood by adding red food coloring to a tub of water. Then they filled clear plastic tubing with the fake dino blood, being careful to exclude any bubbles, which would break the siphon, and they hoisted the middle of the tubing 12 meters into the air using the stage apparatus. The apex at the bend in the tube represents the Sauropod's head. At one end of the tube, the researchers attached a small submersible pond pump, which delivered the same pressure as that produced by the heart of a giraffe. Voilà! The blood flowed freely to the head of the model dinosaur brain--no need for a massive pump or a series of pumping stations. But, the experiments uncovered two very interesting problems; one caused the siphon to fail if they raised it any higher than 8 m, and the other failure occurred if they hoisted the tube higher than 12-14 meters. Using careful measurements and mathematical equations modeling the hydrostatics of blood flow in the simulated Sauropod brain, the researchers pinpointed the physical laws that explained both mechanisms of failure. The reason a siphon works is that the column of water on the ascending side is equally counterbalanced by the same mass of water on the descending side. This is much like hoisting a heavy mass easily by using a pulley balanced by a counterweight. But as the column of fluid rises, the mass of the water inside the tube increases and it exerts a greater downward force from the pull of gravity. This creates a negative force (suction) of equal amount on the descending line increasing proportionally as the tube is elevated. The walls of the tube must be able to withstand the suction created by the siphon or they will collapse. No problem when a rigid pipe or pressure-resistant hose is used, but when a plastic tube similar in strength to a jugular vein was used in the experiment (dialysis tubing), the walls of the tube collapsed, pinching off the siphon. When the researchers hoisted it 8 meters in the air, the dialysis tubing snapped and drenched the stage with puddles of fake dino blood. After that life-size failure on stage, the researchers decided to scale down their experiment and return to the lab. They used a beaker of red water and thin dialysis tubing that was threaded through a strong-walled PVC tube filled with water, all designed to reproduce the appropriate fluid pressures in their scale model. In doing this, the scientists' theory was that if a relatively flimsy tube, like a jugular vein, was surrounded by fluid that was encased in a more rigid material, the thin vein walls would be able to withstand the necessary negative pressure to prevent the vein from collapsing. Cerebral spinal fluid, interstitial body fluids and connective tissue surrounding veins, they conclude, could well have prevented collapse of the intracranial veins when Brontosaurus raised its head above 8 m, and their scale model supported this conclusion. This brought them to a second, insurmountable limit, which prevented the siphon from working above 12-14 m. Back in the theater, the researchers found that when they raised the thick-walled tubing higher than 12 m, the dino blood began to boil at the apex bend in the hose, representing the dinosaur's brain. Had this been a real Sauropod, the dinosaur would have lost consciousness and the bubbles in the blood would have caused an embolism and stroke. This is much like a SCUBA diver ascending from high pressure at depth and suffering the bends as dissolved nitrogen bubbles in the diver's blood. Temperature is only one factor determining the boiling point of fluids; the other factor is pressure. Anyone who has tried to cook in the mountains knows that water boils at a much lower temperature at high altitude. In fact, at the low atmospheric pressure reached at 66,000 feet, which is well within the maximal altitude of the U-2 spy plane, blood boils at room temperature. Thus, pilots must wear pressure suits or the cabin of the aircraft must be pressurized to near sea level. When the researchers raised the tube to a height of 13.4 to 14.2 m, the fake dino blood boiled at the apex of the siphon sufficiently to break the siphon and the fluid flow stopped. This new research explains why no long-necked Sauropods have been found with necks longer than 12 m, and it also gives insight into Sauropod habitat and migration. These dinosaurs had to have been beach goers, or at least they had to stay in valleys and low hills that did not raise much above sea level air pressure. Recently a new species of Sauropod, Dreadnoughtus, was found in Argentina that is much bigger than any previously known dinosaur. All of the neck bones in this gigantic specimen were not recovered, so we do not yet know if its neck length exceeded the 12 m limit predicted by this new study. Dreadnoughtus may have had a shorter stubby neck than other Sauropods, because of the limitation imposed by siphoning blood to its brain. If Dreadnoughtus' neck is eventually found to be longer than 12 m, it must have had arterial pumps in its neck or it had to hold its neck lower to the ground. 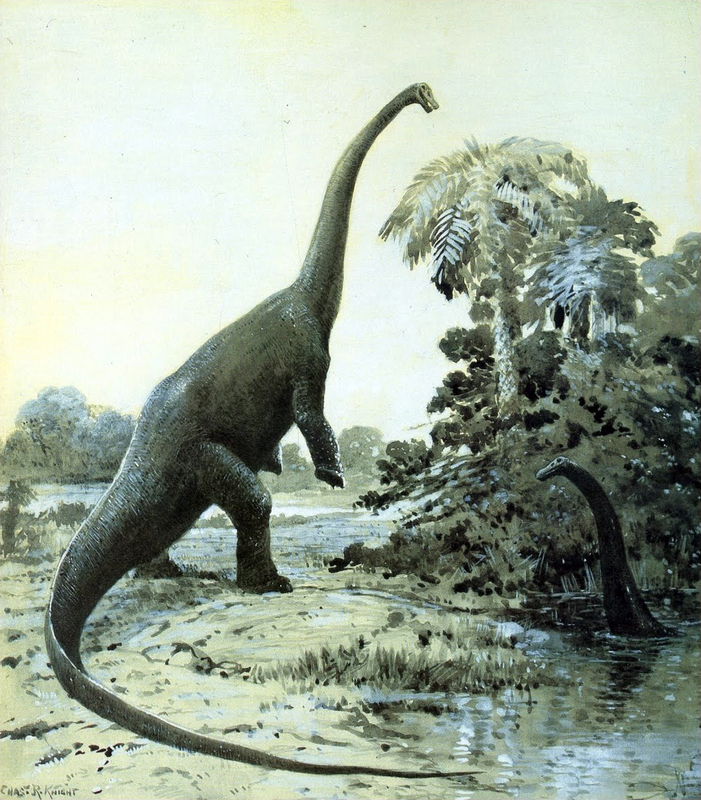 "Some of the Sauropods do seem to have held their necks horizontal or close to horizontal," says Dixy State University paleontologist Jerald Harris, whom I interviewed at the Johnson Farm Dinosaur Museum in St. George, Utah, for comment on this study by the Australian team of researchers. This inference about keeping the neck low is supported by anatomical features of the neck and skull bones, but it is difficult to know for sure. "Sauropods are a really interesting conundrum," he says. "They are very difficult group to work with because of their size. It can take four or five people just to get one bone off of the shelf to study it, and they are so unlike anything that is around today." This research is a delightful example of how careful observation combined with scientific experimentation can give deep insight into intriguing scientific mysteries, using simple equipment, cleaver thinking, and scientific reasoning. Hughes, S., Barry, J., Russell, J., Bell, R. and Gurung, S. (2016) Neck length and mean arterial pressure in the sauropod dinosaurs. J. Exp. Biol. 219, 1154-1161.